Bring a hint of the natural world to your wall using the Whitehall Ivy Nature Hook. 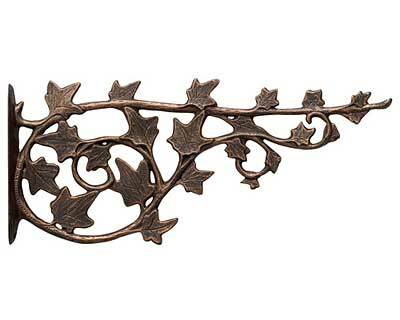 Realistic ivy leaf shapes adorn this bracket, with looping tendrils and a slightly curved top rod for added effect. Each of the leaves has defined veins and edges, bringing even more realism to the piece, while the light bronze colored highlights on the darker bronze colored frame add contrast and interest. This sturdy hook accommodates your lanterns, bird feeders, or wind chimes up to 30" in diameter, and attaches easily to any wall or post with the included screws. The aluminum construction offers both weather resistance and strength, for years of faithful service. Display your hanging accents with style and understated grace using this Ivy Nature Hook. Made in the USA.